A young man matures in the tough environment of an Earth that is now in an eternal winter. Food might be found in cans, on shelves, that was over-looked by other scavengers, or it might be in other people – killed, bled-out, and filleted. Alliances and allegiances are only as good as the people who hold them. Our protagonist is left without the only family he knows when they are killed by roving gangs. He tracks down one of the few people who has ever treated him kindly – a mechanic in a moving vehicle – only to see him roasted over a fire. About to become the next course himself, our young man (Scully) is saved by the mechanic’s friends who take Scully in and give him the skills to become their next mechanic. But even this alliance is only good as long as Scully chooses to make it so. This book is gritty and dark and about as tough and bleak a book as I have ever read. It is more powerful than Cormac McCarthy’s The Road (with a very similar feel). One of the odd, but wonderful, aspects of this book is that it manages to move along quickly, with action sequence after action sequence, and yet it doesn’t feel hurried. In fact, we get so much of Scully’s reflections that this feels like twice as long as it is (because we get so much information, not because it’s dull). A post-apocalyptic world would very likely see a ‘survival of the fittest’ very much like what we have here in Winterworld. But what Scully shows us is that adaptability may be the true key to survival and Scully is very adept here. I was surprisingly moved by this book. ‘Surprisingly’ because I’ve read a fair number of post-apocalypse books in recent years and they tend to feel so much the same, but this one really stands out from the crowd. I really look forward to reading other Winterworld stories. Looking for a good book? 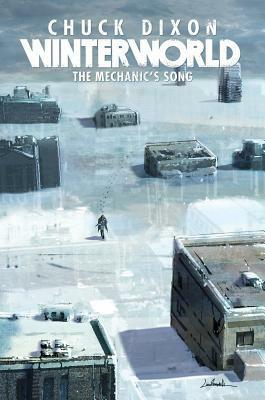 Winterworld: The Mechanics Song by Chuck Dixon is a moving, very dark story set in a bitter cold and bleak future. It is highly recommended.